One of my best friends, Holley, has been asking me for years if I would sew cosplays for her. I generally refuse commissions since I worry that what I make will not fit my client’s body or mental image. Holley, however, is my height and general size; she has worn some of my cosplays in the past and they fit her fairly well. So for her I made an exception, especially after she told me what she wanted me to make. Like me, Holley is a Doctor Who fan. 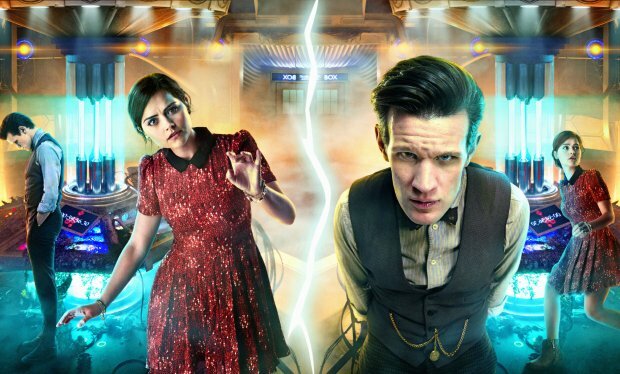 When she began watching season 7 of Doctor Who, Clara became an instant favorite for her – just like me. She wanted all of Clara’s clothes, and I was happy to oblige as long as I could make a version for myself. We agreed to start with the Journey to the Centre of the TARDIS dress, which is one of my favorites and long sought after pieces. It was difficult finding appropriate fabric for the dress. The original Vaudeville and Burlesque dress has such a unique design it was a struggle to find something even close in a fabric I liked. That is until Spoonflower came to the rescue. Granted they are a bit expensive but the fabric is custom printed. In person it wasn’t as bright as expected but it was better once sewn together. I started with my dress to see if the pattern pieces franksteined together were going to work. I used Burda 7309 for the bodice, Burda 7739 for the sleeves and lining skirt, McCalls 5591 for the main skirt, and Simplicity 1727 for the collar. 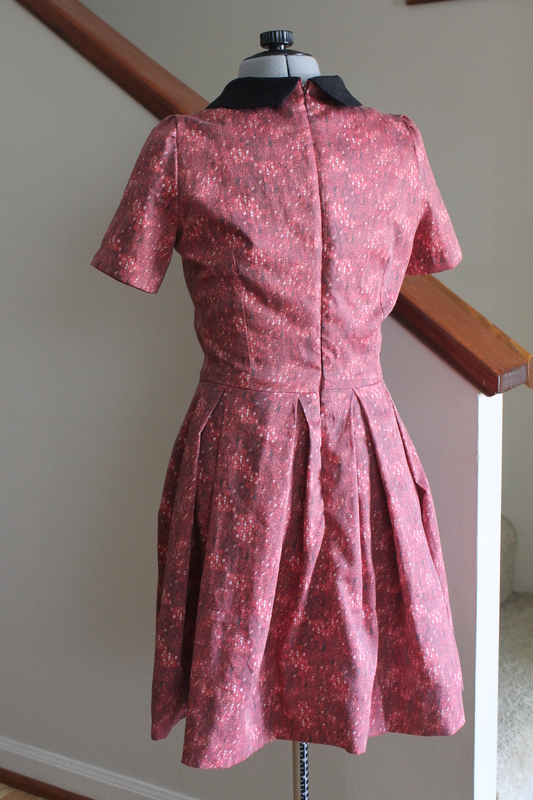 The dress is lined in red cotton batiste in the bodice and skirt. 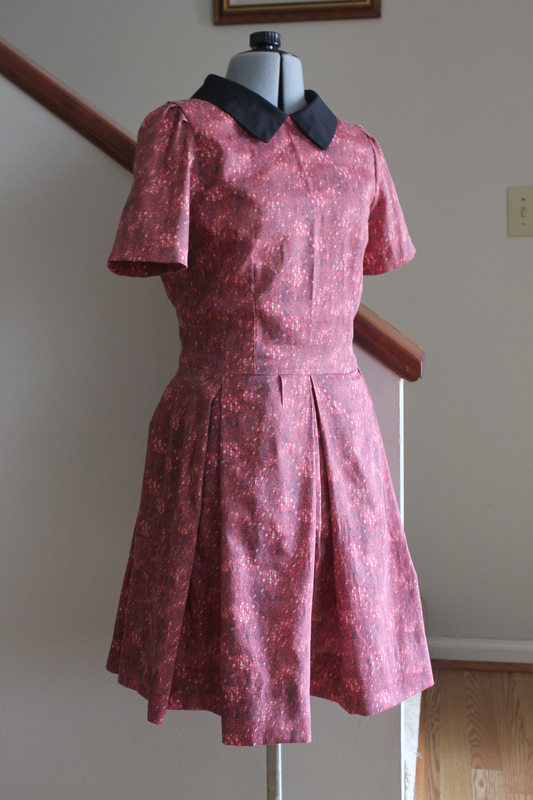 Like always, the collar bias, sleeve hems, and skirt hem are finished by hand. The sleeves are not as puffy and the skirt has larger and less pleats than the original, but I am fairly happy with it. I wore my dress to work on my birthday; three non-Whovian coworkers thought it was cute. My mom thought it was a little retro. Either way, I like it. I made the skirt hem about 2 inches above my knee, higher than I normally wear skirts. I am hoping I will be less self conscious of it’s shortness once autumn comes and I can wear it with tights. Once I finished both dresses, there was enough fabric left over for a skirt. 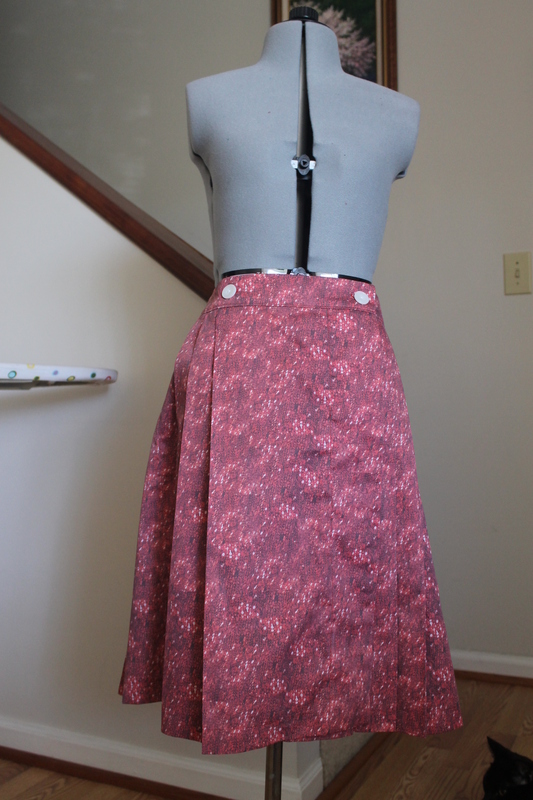 Since I have tons of fabric for other projects, I offered to sew Holley an extra skirt. I used Burda 7049. It took every last inch of fabric to make the super pleated skirt. It is very cute and I am almost sad to see it go but I have plenty of fabric to make my own version. It had been a while since I last used the buttonhole option on my machine but it came out well. 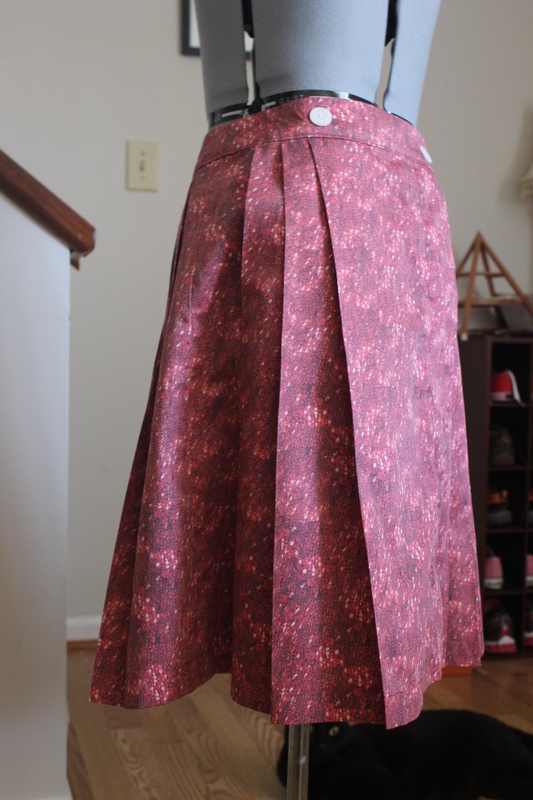 Unlike the dress, I ironed down the pleats to get them to set (I didn’t do so on the dress to make the skirt more poofy). I literally just finished the second dress and skirt about 15 minutes ago. I have now been conned into another cosplay that is due to wear in a month and I have none of the materials. I am going to take a break before tackling that one since I agreed to something that should really take me two months to complete. The things I do for friends. This entry was posted in Doctor Who, Sewing and Crafts and tagged clara, clara oswald, clara oswin oswald, cosplay, crafting, dress, dressmaking, sewing. Bookmark the permalink. Looks so great! Do you recall the name of the fabric you used? Or do you have a link to it? And any chance you’d take a commission for the another one (despite your usual apprehension to do so)? The fabric was named according to the episode. If you go to Spoonflower and search “journey tardis” it should be one of the few that pop up. I used the organic cotton sateen; it’s one of the more expensive fabrics and wrinkles like mad after a wash. I don’t know it’s shrinking capabilities though since we always wash in cold water. Unfortunately I am still adverse to commissions. The dress for my friend ended up being a little too small in the rib area (despite her wearing my other things numerous times without any issues). If I were to make another one, I would require constant fittings. Also I don’t know what to charge. I’ve debated the matter over multiple times. Obviously thr cost of the fabric and shipping would have to be paid but it’s the labor cost that worries me. The original dress only retailed about $80; would cost me twice that in labor alone since it’s custom. Totally understand. No worries. Thanks for the info though! How much fabric did you order? I ordered 4 yards but probably only used 3.5 yards. Depending on how tall you are and depending on how pleated you want the skirt to be will change the amount. There’s a skirt under the pleated skirt too, if I got that right? There is but it is a different fabric. I used about 2.75 yards of lining fabric. Would it be possible to get the pattern for this? I’d love to be able to make this! Size fourteen-sixteen preferred. Thanks! My blog post says exactly which patterns I used. I have just gained a tremendous respect for your ability to create. You did a really good job with that! Thanks, and sorry. I tend to miss the obvious. I’d hoped for a single outfit, but oh well. Thanks anyway. Great job! I hope to maybe find/make one of my own someday! I saw you don’t take comissions, there is absolutely no way to take one? Could I buy a Journey to the center of the tardis dress from you? Sorry, only made two of these and will not be making anymore.